Claremark Act A Fool "Leevi"
After long waiting, Monna gave birth to 3+4 blue roan pups August 19th 2006. 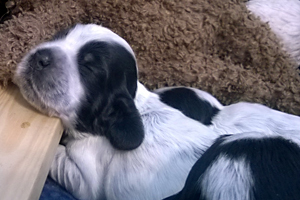 Monna's and Muzzy's pups have now left to their new homes. Best of luck to the new family members! 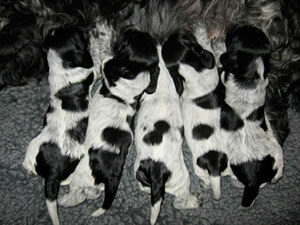 Claremark Back To The Hills "Jenny"
Milla's and Muzzy's 5+1 blue roan pupswere born on October 20th. 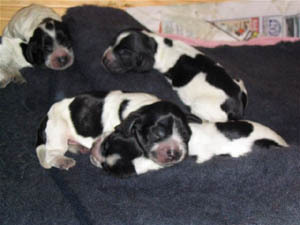 Here arethe d-litters puppies Dashing Dana, Doctor Depp, Dazzled Demon, Dummy Darling, Deputy Dave ja Danny Dealer at the age of two weeks. 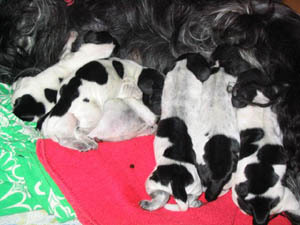 Monna's and Muzzy's pups, 3 boys and 2 girls, saw the day light on July 16th 2008. 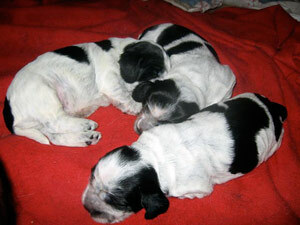 Pups at 2 weeks from left to right: Cinnamon Girl, Cheeky Carlos, Cherry Prince, Confident Kate and Clock Eater. 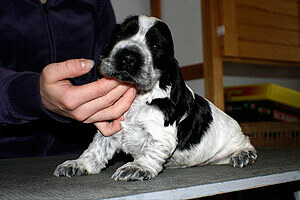 Dana's and Johnny's Mr. Big's were born 13th February 2009. The 3 terrorists from left to right: Easy Johnny, Evaluation Time, Elegant Ethan. 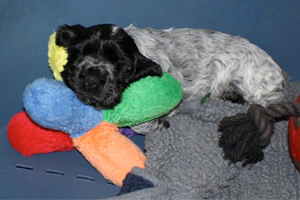 Moira delivered 3+3 blue roan pups on a stormy night 5th June 2009. 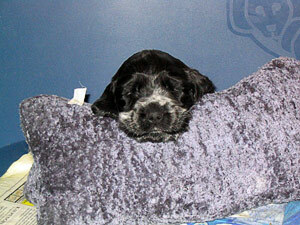 Llitter's proud and charming dad is C.I.B & Ru & Blr & Grand & Club Ch Alen Ashen Romantic Blue "Roma" from Russia. 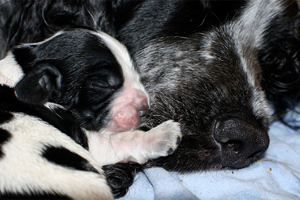 30th April Jenny gave birth to a lovely blue roan dog pup! 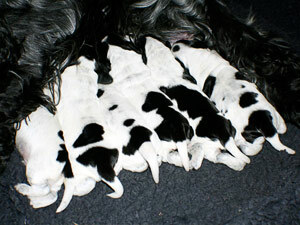 Maisa x Aimo puppies were born on the 11th November 2010!!! 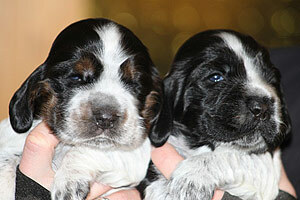 A Blue roan tan girl and a blue roan dog boy. Claremark House Of Fun "Kaapo"
Claremark Just For Fun "Jason"
Claremark Just Say Yes "Raipe"
8.7.2012 Alice gave birth to 6+3 blue roan pups! Claremark Keep Love Alive "Pipsa"
Claremark Keep It Up "Marta"
Claremark Knight of the Night "Jedi"
Claremark King of Kisses "Veikko"
14.9.2012 Claremark Gubelin had a c-section but unfortunately 8 puppies had died in her uterus just a few moments earlier. So, there was only one survivor. 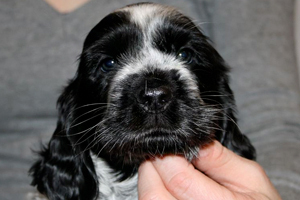 17.10.2013 on a magical night the M-litter was born. 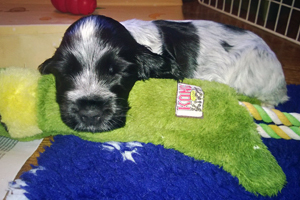 16.8.2014 Alice gave birth to 2+5 blue roan pups! Claremark Never Park Here "Uuno"
Claremark Named After Love "Frida"